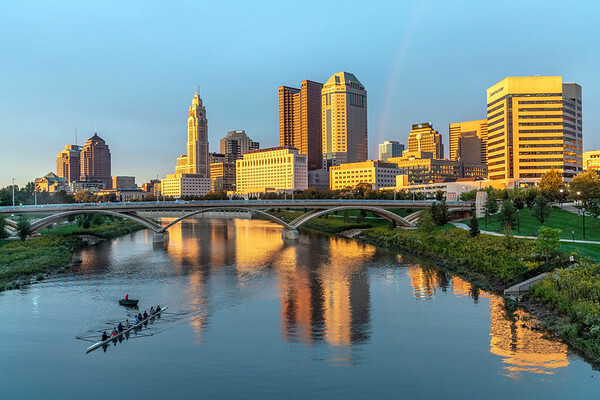 Although I find myself traveling through Ohio with some regularity, I'm typically in something of a rush, and don't have time to enjoy the sights. 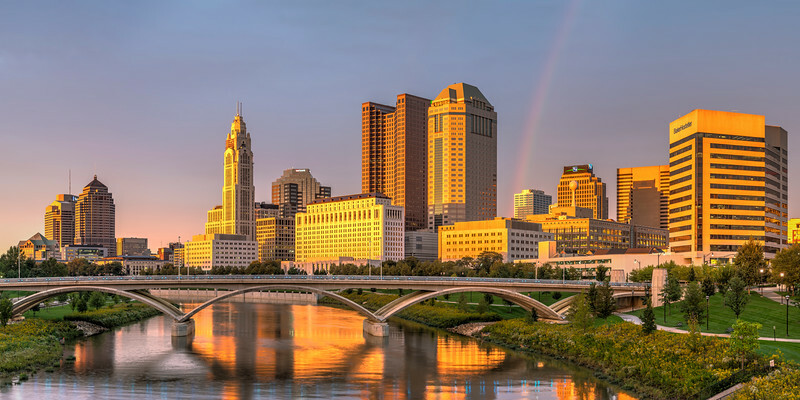 However, I went on a whirlwind tour of American cities on the East Coast and in the Midwest in the fall of 2018, and spent enough time in Ohio to capture some fantastic photos of three of it's most beautiful cities. Eventually, I'll find time to explore some of Ohio's natural sights. 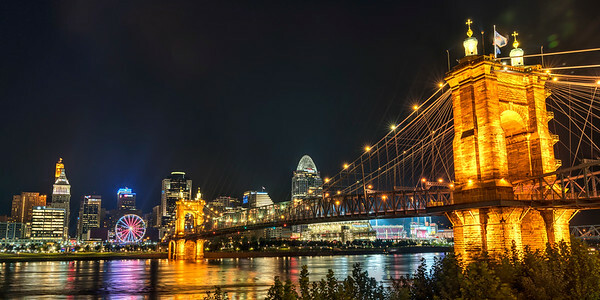 I spent a single night in Cincinnati in the fall of 2018, in the middle of a photographic trip in which I visited a different large American city each night. I'd never visited Cincinnati prior to this visit, and I didn't know what to expect. It may have been the most pleasantly-surprising cityscape I saw on this trip. The city is really beautiful! Available in the following sizes (Panorama A): 20x10, 24x12, 32x16, 40x20, 48x24, 48x24 Triptych (3 x 16x24), 60x30, 60x30 Triptych (3 x 20x30), 72x36, 72x36 Triptych (3 x 24x36). In the fall of 2018, I went on a short but packed-to-the-brim tour of some of the East Coast and Midwest's biggest and most beautiful cities. 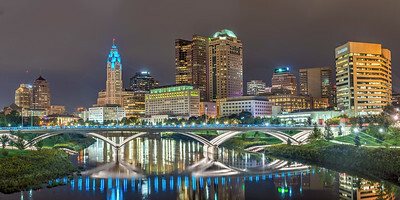 I was able to spend one afternoon and evening in Columbus, Ohio, and shot downtown from the West Rich Street and West Main Street Bridges. Columbus seemed like a fun place, and I wish I could have spent some more time there! Available in the following sizes (Panorama A): 20x10, 24x12, 32x16, 40x20, 48x24, 48x24 Triptych (3 x 16x24), 60x30, 60x30 Triptych (3 x 20x30), 72x36, 72x36 Triptych (3 x 24x36), 80x40, 80x40 Triptych (3 x 27x40), 96x48, 96x48 Triptych (3 x 32x48). I participated in an art show in Cleveland in August, 2018 – it was a great show, and I hope to return! It was during 2018 that I started shooting cityscapes, and I couldn't pass up the opportunity to shoot the city skyline. I really enjoyed my time in Cleveland! Available in the following sizes (Rectangle B): 12x8, 18x12, 24x16, 30x20, 36x24, 45x30. I participated in an art show in Cleveland in August, 2018 – it was a great show, and I hope to return! It was during 2018 that I started shooting cityscapes, and it was dumb luck that the Browns happened to be playing a preseason game, which resulted in a lot more light than would have appeared on any other night I could have taken the same photo. Sometimes there's a lot to be said for dumb luck! Available in the following sizes (Panorama B): 30x12, 40x16, 50x20, 50x20 Triptych (3 x 17x20), 60x24, 60x24 Triptych (3 x 20x24), 75x30, 75x30 Triptych (3 x 25x30), 90x36, 90x36 Triptych (3 x 30x36).